Not sure what to get the schooler on your list this year . . . Here are some ideas that will not only delight the recipient but advance their education as well. 1. iPad – As my friends, family and colleagues know so well . . . I love ipads! The device is so portable, so easy to use and there are so many apps that allow children to explore, create and learn. Perhaps check out the new iPad mini – slightly smaller for little hands. But whatever tablet you finally land at, make sure you get a case! 2. iTunes gift cards – dedicated cash to purchase those great apps, books, music and more – Gives kids a chance to buy wonderful education items that they like and are suited their learning style. 3. 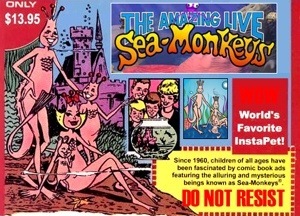 Sea monkeys – the gift of a pet that does not take too much of parents’ time or energy. 4. Art supplies – paint, paper, glue, colored pencils, clay and play dough – great gifts that encourage creativity and help children express thoughts and ideas. Also helps to develop gross and fine motor skills. 5. Place pass -local zoo, museum or leisure centre. This gift is good for the whole family and encourages lifelong learning! 6. Color printer – kids can be pretty adept technology users for the most part, so help bring their digital creations to life by getting a color printer. 7. Book sets – usually at this time of year you can get boxed sets of books. This saves trying to find book two or three down the road and encourages more reading time. 8. Audio books – a special gift for the whole family! Instead of a video in the van, pop in an audio book. Audio books can be significantly more advanced in reading level and therefore can appeal to the adults in the vehicle too. Plus playing an audio book verses a dvd still encourages kids to look out the windows and see the world around them. Finally, don’t forget a gift that furthers their unique personal passion – something they love to do! This helps develop skill and expertise in an area and helps to create a strong sense of self! Previous Post: Hot Off the Press for Homeschoolers! All you want to know is already here. Even the explanation presented are all really clear. Thanks to the genius writer! Hey there. I have bought them from iTunes for my ipad and Chapters. Chapters sells CDs. You can also borrow them the library! Great ideas! I would love to know where I could purchase audio books? I have tried to find them, without any luck.